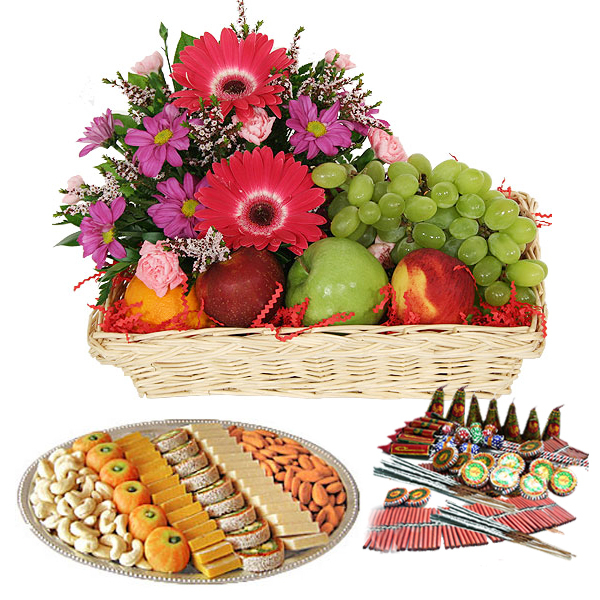 Product Consist : 2 Kg Seasonal Fresh Fruits with 12 Mix flowers arranged in Basket along with Assorted Sweet in Box (Weight: 500Gms) and Cashew nut ( Weight: 250 Gms) Almond (Weight : 250Gms) along with Diwali Fire Crackers (Worth Rs. 300/-) (Note: Firecracker will be deliver as per their availability no specific choice for it). 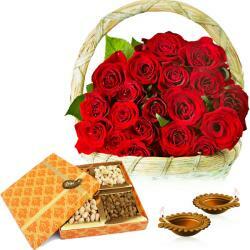 Fabulous flowers basket will definitely cheer your dear ones from the deepest corner their heart. freshness and lovely colors give the love one cheerfulness and delight them. which exactly is full in this hamper. 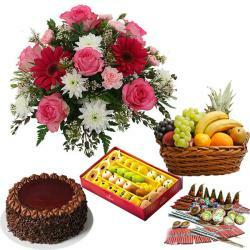 This is a hamper having 2 Kg Seasonal Fresh Fruits with 12 Mix flowers along with some very delicious dry fruits and sweets for Diwali. 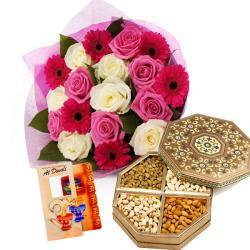 Crackers being the most significant part of Diwali celebration your dear ones will love this gift. 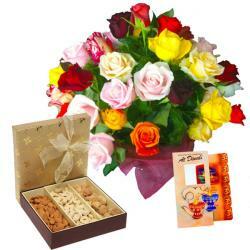 Send a special surprise to them that they will love and cherish for long. Product Includes :2 Kg Seasonal Fresh Fruits with 12 Mix flowers arranged in Basket along with Assorted Sweet in Box (Weight: 500Gms) and Cashew nut ( Weight: 250 Gms) Almond (Weight : 250Gms) along with Diwali Fire Crackers (Worth Rs. 300/-) (Note: Firecracker will be deliver as per their availability no specific choice for it).